Polymers confined to nanoscopic dimensions are found in many applications including photoresists, asymmetric membranes, and nanocomposites used for automotive components. Recently, research has shown that nanoconfined polymers do not exhibit bulk properties; a major issue in nanoscience concerns the underlying cause of these nanoconfinement effects. Our lab has recently developed novel fluorescence approaches for investigating polymer properties at the nanoscale and has shown quantitatively for the first time that surfaces and interfacial effects are responsible for this behavior. Ultrathin polymer films exhibit changes in dynamical and mechanical properties with decreasing film thickness. The glass transition temperature (Tg), the temperature at which a polymer goes from an equilibrium melt to a non-equilibrium glass upon cooling, is observed to decrease in ultrathin polystyrene (PS) films. Using a unique fluorescence technique, we have measured the glass transition temperature of PS free surface layers atop bulk PS and have demonstrated that the Tg reduction observed in ultrathin films originates from the free surface. This is accomplished by fabricating multilayer films where fluorescence dyes, sensitive to the local density of the matrix, are covalently labeled at trace levels to select polymer chains within the sample. Structural relaxation of glassy polymers (termed physical aging) is responsible for densification and loss of mechanical properties over long time scales. We have recently demonstrated that free surface and substrate interactions can be used to suppress physical aging in ultrathin polymer films. 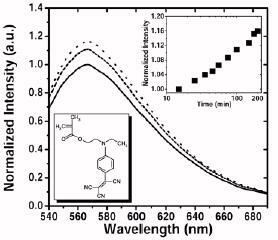 Physical aging rates at the free surface and substrate interface of ultrathin polymer films were measured using a fluorescent rotor probe sensitive to the local free volume of the polymer. Polymer nanocomposites are light weight, high strength materials that use nanometer sized filler particles to create large amounts of interfacial interactions to tune the properties of the material. We have used fluroescence to study the glass transition and physical aging in real and model polymer nanocomposite systems. Using doubly-supported ultrathin polymer films as a model polymer nanocomposite, we have determined an effective interparticle distance between nanofiller particles. 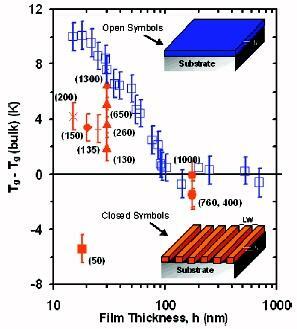 Poly(methyl methacrylate) (PMMA) nanostructures used in microelectronics have high surface areas resulting in large decreases in the glass transition temperature that can affect stability of the nanostructures during processing. Using embedded fluorescent dyes, we have measured the Tg of one-dimensional (1-D) nanostructures (parallel lines) formed by electron beam lithography. We compare these nanostructures as a function of the width of the nanolines to the case of fully-intact polymer films. 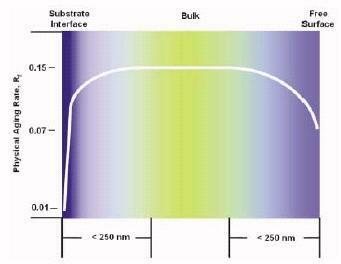 For example, the Tg of 50-nm-wide PMMA nanolines on silica is ~15 K lower than that of a PMMA film on silica of the same 18 nm thickness. Attractive PMMA-silica interfacial interactions increase the Tg, while free surfaces decrease the Tg of PMMA in ultrathin films relative to bulk PMMA. 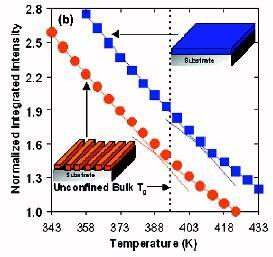 The impact of free surface and substrate interactions of the glass transition temperature of ultrathin polymer films has been studied by many groups. Here we demonstrate for the first time that narrow polymer-polymer interfaces between two immiscible polymers can have a stronger effect on glass transition properties of the ultrathin films than that of a free surface. 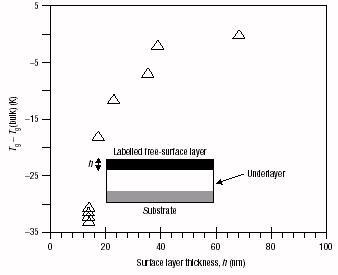 The Tg of ultrathin polystyrene (PS) free surface layers are highly dependent on both the type and amount of material underneath.